Today is Day 2 of Wego’s National Health Blog Post Month. There are two prompts to choose from each day. One was to write about the weirdest thing about your health. Right now everything seems weird. After yesterday’s long heartfelt and emotionally exhausting post, I decided to go with the second prompt. Find a quote and use it as inspiration. The quote above, from Gibran, “When you are sorrowful look again in your heart, and you shall see that in truth you are weeping for that which has been your delight.” is exactly what I am going through these days. I am sadly missing the people in my life who I loved and I am sad that I have similar troubles with my health that they had. I am looking again at my sadness and hoping for a silver lining. There are some hopeful things that I can gain from this experience. One. I loved them. They loved me. Everyone should be so lucky to have experienced that kind of love. Two. I have their experiences to learn from. I will honor them and try not to make the mistakes they may have made. Three. I have knowledge, strength, and support that will help me through this. I urge you to look again in your heart. What makes you sad? Could it be that you are longing for the thing that once made you happy. Perhaps knowing that you were once happy is not enough. Make yourself happy again. At least now you know what you are missing. There is something I learned at my sister’s funeral last year that was evident at Sidney’s memorial as well. People don’t always share the full scope of who they are with everyone they know. A friend told me that sometimes the person wants it that way. I respect private people. I really do. But what concerns me is people who aren’t being private on purpose, but are so giving of themselves that they focus on other people so much that we don’t get to know all the wonderful attributes they have or realize the many accomplishments that they have achieved. A diamond in the rough. A person with unlimited potential. A humble person who does not need to or want to call attention to themself. A caring person who makes the effort to get to know you and help you, asking for nothing in return. I could be describing my sister, Karen, or my friend, Sidney. At my sister’s funeral in July of 2011, many people came to me and said they didn’t know Karen had started a group called Humanitarian Efforts and had sponsored an orphanage in Mexico. And people who worked with her on that didn’t know that she was a soccer mom and had volunteered at the local elementary school, and some people never even knew she had a sister! I found out so much about Sid at her memorial. I missed out on getting to know her better. I am lucky to have known her at all. She was a remarkable woman! I was touched by the testimonial that was shared by her co-worker who described her many accomplishments with installing computer systems and her extensive expertise in technology. I did not know that she worked in I.T., like my husband. I was aware of how she loved her sorority sisters, but I did not know that she had a group of guy friends and was considered “one of the guys!” Her close friends from high school and college suffered a huge loss with her passing. I knew that she was a regular at Olive’s and Tallyrand, but I had no idea what a “family” and support system that community was for her! I did not read all of the many posts on her blog and I knew very little about her relationship with her boyfriend of fourteen years, or with her beloved family. I did not know that she had a sister, until I learned all of this after she passed. What I did know about Sidney Patrick is that she was a lovely person with a beautiful smile. She was the creator and a leader of the group that I am in on Facebook, the So Cal Lady Bloggers. Sidney was welcoming and encouraging. She read everything that I wrote and she was the person who commented the most on my blog. She had a very sharp wit, excellent sense of humor and was a gifted writer. Her blog, My Mother-in-Law Still Sits Between Us, is about hoarding and how it affects the adult children of hoarders. She became an expert in that field and was interviewed on Huffington Post Live as such just a few weeks before she died. She made an impact in the world of hoarding and was devoted to educating and helping people who were affected by it. Sidney Patrick, like my sister, made a difference in our world. Besides significantly making a difference in the lives others, having an infectious smile and the ability to be a gracious hostess, Sidney and Karen had something else in common. They both died too young, and they both died of complications due to Liver Disease. Liver Disease and Diabetes run in my family. I have Diabetes. I have the pre-cursor to Liver Disease; high triglycerides and a border-line fatty liver. My mother died of Cirrhosis of the Liver (NASH). My aunt (my mother’s twin sister) died of it. My sister died of it. They all also had Diabetes. There is something else that my sister and Sidney had in common, they did not talk about their disease. They down-played their own suffering. They were martyrs in their own right. They did not do for themselves that they would have done for countless others, what they would have done to help anyone else that they loved, they did what they always did when it came to something being about themselves, they selflessly kept it private. If I learn nothing from their stellar examples as humanitarians, from the beauty and peace that they brought countless people as the angels that they were, if I am unable to live up to that potential, I must learn from their fatal flaw. . . I hope that I will not have that in common with them. I realize now that this is why I started a journal blog. I am about lots of things and I want to be fully apparent to all who know me. I am not private. I want my friends to know what I am all about. Who I am, completely. I have not yet discussed my health issues on my blog because until now I wanted to share only the positive things that happen in my life. I realize now that I must make this a positive. I must share the things that I do to manage my health, to improve my health, to avoid an early death. I must give it the same effort that I would give to anyone else that comes to me for help. In helping myself live a healthier life, I can help others. The potential to help others is limitless. My sister can help others with Diabetes and Liver Disease through me. After she died, I thought I would carry on with her humanitarian efforts. I thought I could help children in Nigeria who had been orphaned and then sold into slavery. I tried. I am not sure if anything that I did made a difference for anyone. But, I vow I will do my best to make a difference in my life. I will help myself and my family to live longer, healthier lives. I believe I can do that. I can make a change, a difference. I will commit myself to that. Correction. I will re-commit myself to that. I must admit, that I fell silent. I have even been ignoring my disease. After my mother passed away in February 2005, and my sister was diagnosed, I was tested at Karen’s urging. I found out that I too had the pre-disposition for Diabetes and Liver Disease. I had high triglycerides and high blood sugar levels. At that time I did tons of research to find out anything I could do to improve my health. As it is for most health issues, a regiment of exercise and a specific diet is recommended. I found out about every kind of food that is bad for the liver and pancreas and all the nutrients that are good for the digestive organs and the immune system. I made a list of the foods I should eat and the foods I should avoid. I followed the diet strictly and I improved my triglyceride level to better than normal and my liver did not appear enlarged when I had an ultrasound. I maintained a healthy blood sugar level and I did not have to test my blood sugar. I achieved something at that point that doctors rarely see, in fact they said it could not be done. And then, last year, my sister died after her long-awaited liver transplant fell through and her suffering came to an end. For some reason, I lightened up on the regiment. I gained weight. I am now taking medicine to control the Diabetes. I feel pain in my abdomen after large meals and I have been eating the dreaded meats and all the other things that are on my “no-no” list. I am killing myself and I do not know why. Sidney’s death shocked me into reality. I can do something about this. I will do something and I will be open and honest about it. I will blog about it. The good, the bad, and the ugly. Hopefully, mostly good. So, I start now. 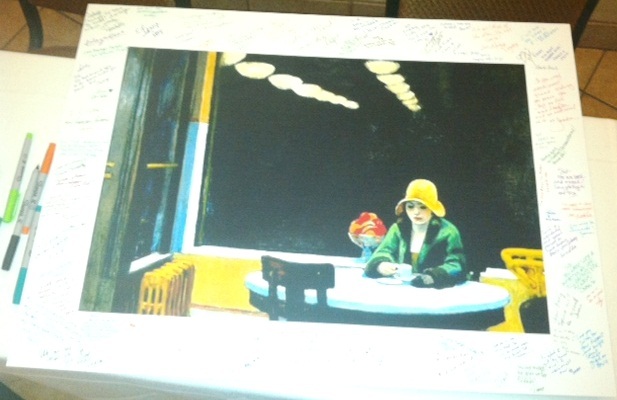 With this ode to Sidney and Karen who inspire me in countless ways. I start now with this blog post. I start now, with enrolling in a nutrition class lead by Carol Takakura of Creative Wellness with Carol that I will be writing about weekly. I start now, by blogging 30 posts in 30 days for National Health Blog Post Month with @wegohealth. I start now by using my list, following the regiment and living a healthy lifestyle. I can’t go back. I can’t change anything that happened or anything that I did or didn’t do. I can’t help Sidney or Karen or my mom or my aunt. But I can help myself and my kids. I start now. After my parents and sister passed away, I wrote about the Seven Stages of Grief It still helps me to review it, so if you are suffering from any loss and are not familiar with the stages or how they can come and go – please fee free to contact me and I will be here to listen and cry with you. I Survived My Bloggy Bootcamp! I have been to conferences and networking events before, but nothing quite like this. Calling upon my past experiences and from what I gathered from my Facebook blogging group’s advice (seasoned bootcampers like Carolyn West/This Talk Aint Cheap told me some stories) I planned ahead. I am glad I did! I got everything out of the event that I hoped for and much more! *Get seen and known . . . Make A Splash! *Meet Bloggers from So Cal Lady Bloggers Group . . . make a genuine connection. *Meet influential Bloggers . . . make an impression. Armed with new business cards (complete with all of the necessary components that a blogger/writer/life coach/event planner should have including my Twitter handle, associations and a cute photo of myself,) I set out to meet everyone I could and have some fun doing it! Before I left for Las Vegas, I took a list of So Cal Lady Bloggers that planned to attend this conference, I added pictures and blog names and I printed it on both sides of an 8 1/2 by 11 inch piece of card stock. I put a nice stack of business cards, a few sharpies, and my folded up list in a wristlet purse. My plan was to check off each lady as I met her. Rather than just putting a check by each name, I asked my new friend to sign her name by her picture. It was so much fun asking for autographs and it made each blogger feel like a star! (I love it when things work out!) I carried my wristlet everywhere I went and made sure to swap business cards at every opportunity. I smiled at everyone, everywhere I went, even outside the conference in the hotel, just in case they were a blogger, too. I noticed that most of the people were smiling back and having a good time. I am usually a little reserved at these things (believe it or not!) and I stay to myself. This time I was determined to make the most of the time and meet people. Another important part of my plan was to learn about blogging. Afterall, that is what I signed up for! Part of my strategy was making sure that I did not share a room. As much as I would have loved to save money, have a bloggy companion, and have tons of fun – my objective was to learn. I know that if I don’t have a quiet place to reflect and process, much of what I learn would have stayed in Vegas. In this case, I did not want that to happen. Although my hubby was with me, I was still able to have space to spread out all my stuff, be alone with my thoughts, bounce ideas off an objective (however imprisoned) supporter, and have quiet time to write my notes. 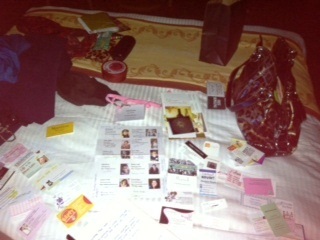 My stuff on my bed in my room at my bloggy bootcamp! I took a composition style notebook and a pen to take my notes, as advised by the SITS Girls who put on Bloggy Boot Camp. It was good advice because I didn’t want to have to worry about my laptop, battery life and WiFi connection the whole time. I noted key points that I wanted to remember during the fabulous speakers’ presentations. I wrote my reflections for this post. I took down some awesome quotes. I am glad I wrote them in my notebook, because my cell battery did die and I couldn’t tweet out some of the epiphanies I had. I took some great pics that I Instagrammed and hashtagged. I tweeted. I shared. Next time, I will bring a separate camera because I missed some amazing “Kodak Moments” when my phone died. I noticed a few bloggers used their phone to take pics of the slides on the screen during the presentations. What a brilliant idea! Why didn’t I think of that? That’s one to remember for next time to really cut down on note taking. The conference, the organizers, the speakers and the sessions were all fantastic! It was clear and concise. The information was relevant. The speakers were well prepared and professional. I really got what I came for! I was blown away by the contagious energy and excitement from one of the most successful bloggers around, Laurie Turk/The Tip Junkie. She shared her Top Ten Blogging Success Tips. She was so willing to share that it really gave me hope that I can and will increase my SEO. I was so happy with myself that I didn’t have to ask what that was or even look it up! Search Engine Optimization is something every blogger who wants to increase their readership should know. Laurie’s tips made it seem attainable. Cynthia Wheeler/@napwarden spoke to us about Great Blog Design. If you visit my blog often you may notice I already made a few changes. She gave terrific advice and if I can afford to get a professionally designed blog, I will know where to go! The best speaker there was someone I have met personally on a few occasions and was even on my list! Trina Finton/The Gaming Angel gave an insider’s look at gadgets and apps that all bloggers should know. There are quite a few apps and programs that I want to try. Danielle Liss/Fitfluential gave the bloggers a quick but important overview of the Legal Basics of Blogging. I was happy that most of what I remember from business law (a favorite class in college) still applies. Most of the copyright, trademark, contract and licensing rights can be looked up online. Danielle helped to clear up any blurry issues where blogging is concerned and pointed out how to get the correct and current information. That was awesome! I was enthralled with the final speaker, Elizabeth Jayne Liu/Flourish in Progress who talked about her personal experience with blogging. She spoke about being authentic and developing a unique voice. She hit it home for me and made me feel so glad that I am doing this. She helped me to realize that it is okay to “Speak the way I speak, say what is on my mind,” and to know that “the more I write the more I can get to know myself and become comfortable with myself.” She is such an inspiration to me! I couldn’t wait to meet her and I was lucky to get her awesome business card! I was inspired by the Tribe. The sponsors were in on the underlying theme. I am bangin’ the drum! We need each other. I want to thank the sponsors. Not because they made my experience top-notch, not because it is the right thing to do, but because I can. I am a blogger and it’s what I do! Shout out to the sponsors: Ford Warriors in Pink, Mirassou Winery, and Jewel Kade. 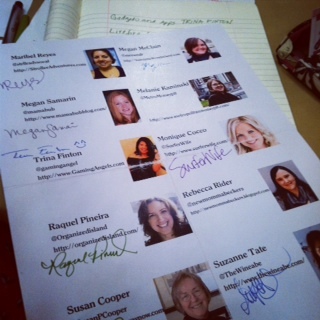 All of the ladies that I met at Bloggy Bootcamp were wonderful. They are just normal people who have a blog. They are just like me. We are all Rock Stars! Mommas, Foodies, Clickertons, Fugalistas, and Adventurers. Best of all, we like to share, to learn, to embrace and to empower. Cheers to the bloggers!! Have you ever sat next to someone who had an inspiring story? Tell me about it! Leave me a comment. Life should be fun, right? I totally think so! I wish everything was fun. Or, even more fun! We love to laugh in our family. I am grateful for all the different kinds of laughter. I love when people have “laugh-lines” instead of wrinkles. I love when people laugh at my jokes or think I am funny. I love to tickle little kids. I still try to tickle mine. I love smiles and snickers, giggles, and guffaws. Welcome to my very own “Fun Zone”! Tell me, what makes you laugh? I know a kid who loves babies and kittens. He’s a pretty tough guy most of the time, but has a soft spot for cute adorable little things. There is this sound that he makes when he sees something that strikes a chord. . . a high-pitched whiny “Ohhaawwhh!” Followed by a an airy gutteral half-laugh as if in utter disbelief that anything could be so cute. This one is a crack-up to witness and then hilarious when you join in. It’s that uncontrollable contagious giggle-snort-laugh that you just can’t stop and at first think it’s annoying until you get it too and everything seems funny and you just keep laughing and laughing until your eyes water and you think you might have just peed in your pants!!!! The head-shake/nervous laugh combo. AKA the “tell.” When I want to know what happened and I say something totally funny and I get this reaction, I know they either don’t get the joke or they are up to something. I don’t want to give away my secrets, but I can read this one like a book! The sigh giggle that girls make when they are in love. It starts with a deep breath and then a light “hahhhh. . . . hee hee hee. They most likely are thinking about something he said or did. Ah, young love. Butterflies. Hearts and roses. The laugh so hard you scare yourself gut-busting laugh. This is the one that can actually wear you out if you keep it up long enough. I went to a comedy club when I was pregnant once and the comedian was so funny, I laughed so hard I thought I was going to hurt the baby! Comedy shows and movies are always on at my house and laughter is going on all the time. I just love it!! I read this book for the first time as a young girl and loved it. I was asked what inspired me to be a writer, and I thought about how I read a book once and never forgot it. I was pleased to love it just as much after reading it again thirty years later. A Woman of Independent Means is a story told in a series of letters and correspondence over the lifespan of an average, yet brilliant, young American woman. It goes beyond a coming of age novel. Through her letters, we learn how to read Bess’ thoughts and we realize her inspiration and motivation as she navigates through life. The coolest thing about rediscovering this book now is that there is an updated preface in new edition that Elizabeth Forsythe Hailey wrote in 1998. She was close to my age when her work was first published and she wrote it while raising her two small daughters. She says that “the traditional advice to writers is to ‘write what you know.’ I always amend that to ‘write what you can imagine knowing’.” I feel as though she is speaking directly to me and it is at this moment in my life that I needed to hear these words from the woman who first inspired me to write so long ago.